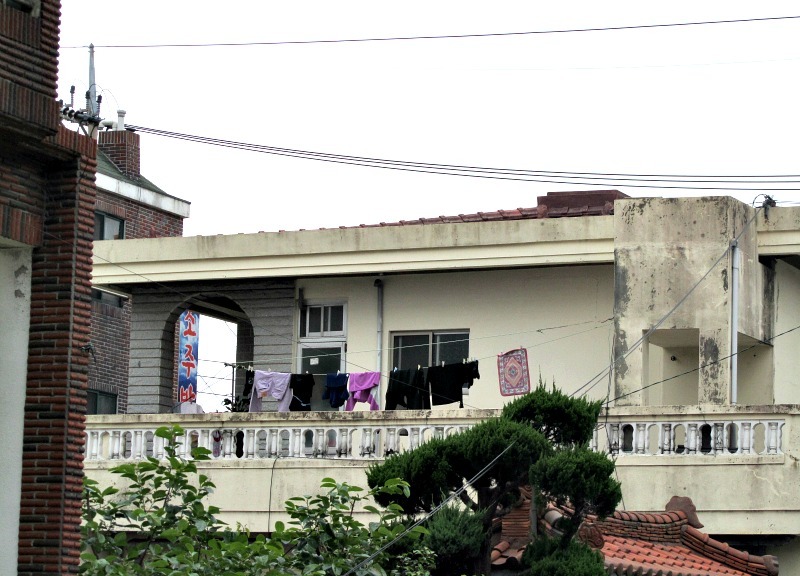 I snapped these pictures while I was walking around in one of the neighborhoods in Korea. Everyone hang dries their clothes there. It's the norm. Dryers are very hard, if not rare, to come across and find. While I was in Jeju, I found a dry-cleaning/laundromat that was gracious enough to wash my clothes during the month of my visit. The owner was very nice and gave me a great deal for my loads. I remember picking them up a few days later and they were hanging on the drying rack...still damp. (It was a cold and rainy week at that time.) She asked if I wanted to wait one more day instead, and pick them back up the morning. I just smiled and agreed. But as I was walking back to my motel, I was a little confused. I thought, "Why couldn't she just throw them in the dryer?" None of my clothing articles were that delicate or fragile to avoid any kind of heat. Then it occurred to me- there was no dryer, anywhere, in her shop, or at any other dry-cleaners at that. It was a very interesting reality. It then brought me back to my childhood years. 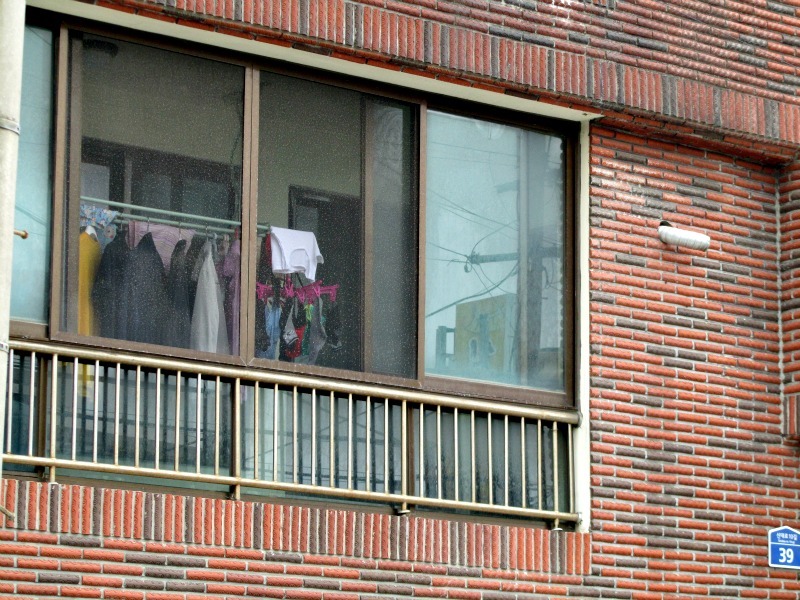 You see, growing up, I remembered my mother hanging up our clothes to dry out on the balcony patio. I always looked forward to that distinctive smell of our soap and fabric softener blowing in the air. That was my favorite part. It was a daily routine I was very much familiar with. When my parents divorced, I moved back to the states with my dad. He, of course, naturally bought a dryer for our new place. I missed the smell of the soap/fabric softener, though (and my mom), filling our home. Ever since I moved out on my own (7 years ago), I got into the habit of hang drying all my clothes (excluding my underwear and towels.) You could say it's a nostalgic routine for me that I very much enjoy. Plus, being that I live in Arizona where the climate is very dry, jeans and t-shirts dry so easily. I could have something ready to wear under 30 minutes flat. This desert weather has it's advantages at times. Ha, that`s funny but true! 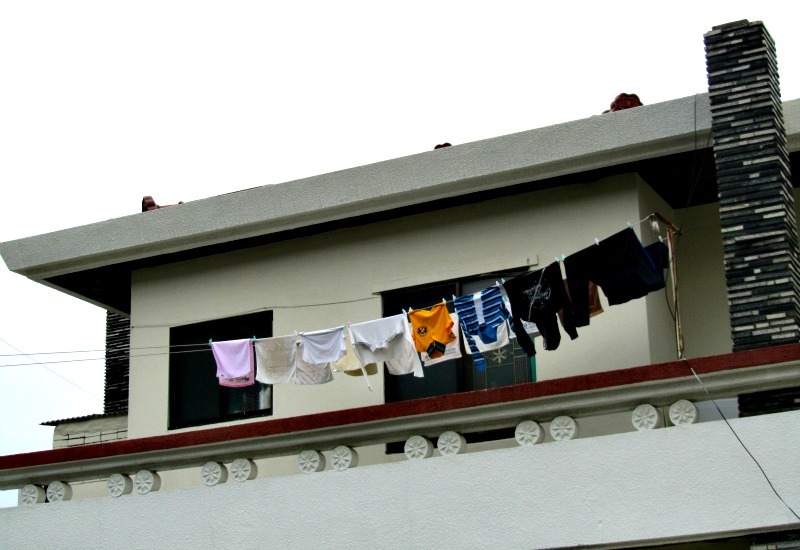 I miss seeing clothes hanging out to dry! A fond memory from childhood! My husband and I plan on visiting Korea next year and we hope to stop by Jeju! I wish we could hang our laundry out to dry. It would save so much money. Aw, man. You're givin' me childhood feels and nostalgia and such. Jamaicans also, largely, hang stuff out to dry. Whenever we fly back down and stay with my grandparents, I can count on seeing all our stuff , dripping, on an given day, by the back gate. ....plus, y'know, we still dry all kinds of laundry outside, here, in the U.S. Haha. Yeah. It really is like that in Korea. :) Maybe we could follow each other on Bloglovin and/or GFC? More Kate less kardashians please US!!!!!!!!! !